The Science Fair is coming up and your student wants to do something new that's never been done before. Inventions are a great way to showcase your student's abilities and get the attention of the judges. Most inventions are simple to build yet impressive enough to stand out among other projects. Let your student design a stethoscope out of an old paper towel cardboard tube. Paint the tube so it's colorful and attractive. During the science fair, ask the student to get volunteers from the crowd to demonstrate how the stethoscope works. The student will simply place one end of the cardboard tube on the volunteer's heart and listen through the other end of the tube. The participant will run in place for a few minutes and the student will test the stethoscope again to demonstrate the difference between resting heart beats and active heart beats. Potatoes can be conductors of electricity. A galvanized nail, a copper wire, a potato, a voltmeter, and some wire clips to connect the meter to the wire and nail can help you create a battery that will power an alarm clock or other small appliance. You can even help your student expand the project to include other vegetables or fruits. Conduct your experiment based on which vegetables or fruits conduct the most electricity. Have the students research the materials used in making a hot air balloon and try to make a simple one of their own. They can use tissue paper, thin plastic, straws, or other light materials to design a balloon and basket. You can try different ways to light the candles or other source of flame to help lift the balloon. 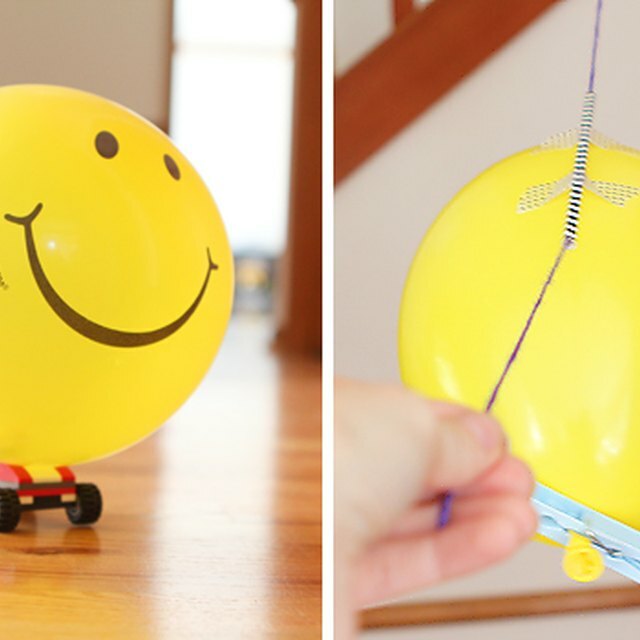 Help your student get permission to demonstrate how to light and lift the balloon at the science fair and explain how the gases lift the balloon. Help your student build a variety of paper airplanes with different wing shapes, extra fins, or whatever additions they choose. Ask the student to test each plane and record the results of flight time, speed and maneuverability. Showcase the different models at the science fair and have the student explain why certain models were faster or slower than others. Allow people to test the airplanes and give their opinions on which plane flew the fastest. Cahoon, Brittiany. "Easy Inventions for Science Projects." Sciencing, https://sciencing.com/easy-inventions-science-projects-7910963.html. 13 March 2018.